Although bonobos and chimpanzees are similar in size, bonobo calls sound an octave higher than chimpanzee calls. 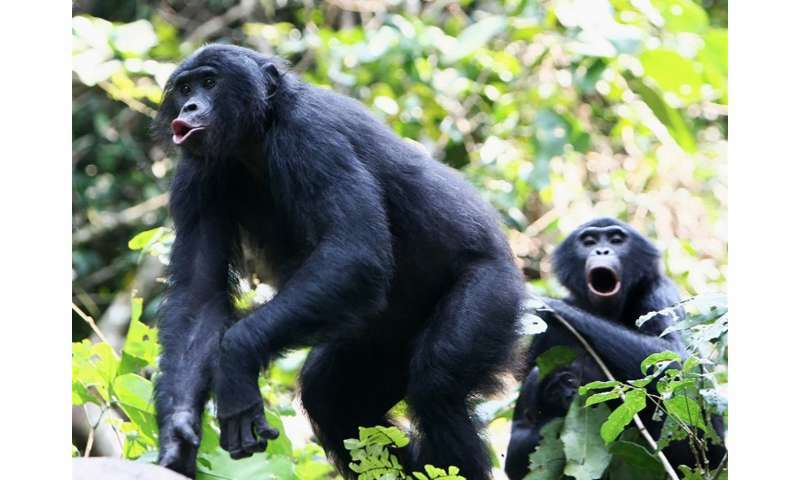 Researchers at the Max Planck Institute for Evolutionary Anthropology in Leipzig, Germany, explain this discrepancy with the fact that the vocal folds of bonobos are only half as long as those of chimpanzees of the same age. Whether or not other factors have contributed to this discrepancy is subject to further research. We can easily see whether someone is large or small, but we can also hear it in the pitch of their voice. For a long time, research on the accoustic communication in humans and animals has accepted the paradigm predicting a causal relationship between body size and voice pitch. Meanwhile, evidence from a large number of animal species has revealed that this relation does not always apply. Various animal species, including chimpanzees, have mechanisms that enable them to produce sounds that are lower than expected for their body size making them sound larger than they actually are—a common phenomenon in animal communication. Scientists from the Max Planck Institute for Evolutionary Anthropology have now shown that bonobos are the only example were the mismatch in sound production runs counter to exaggerating body size. Given that bonobos and chimpanzees overlap in body size and mass, this difference is rather unexpected. The researchers explored morphological structures of the larynx, the sound producing organ of mammalian species. A close look at the vibrating parts of the larynx revealed that the differences in voice correspond with vocal fold length: those of chimpanzees are twice as long as those of bonobos. Important to note is that bonobos are exceptional in other ways. Highly unusual compared to most other species is that females can dominate males. Bonobos are also very tolerant towards in-group—and especially out-group—bonobos as compared to their sister species chimpanzees. "Thus, one possible explanation for the high voice of both male and female bonobos, is that it signals tolerance to in-group and out-group bonobos, facilitating non-aggressive interactions between them," concludes Gottfried Hohmann of the Max Planck Institute for Evolutionary Anthropology and senior author of the study.